Traditional model in luxurious finish. They have worked out platforms that match the bottoms of shoes or boots and a nice curl. The slots in the platforms indicate the use of luxurious straps as well. As shown underneath serious speed skates were developed later on with the qualities of this model in mind. This model has been designed especially for serious speed skaters. The traditional runner blades were made longer by extending them both at the front and at the rear. This pair still has a rather tall tip; later models had fronts that were not taller than the platform itself, as shown underneath. Contact between boots and skates was improved greatly by modelling the platforms to the boot bottom shapes. The Dutch called this model 'wooden Norwegians' as the platforms made them look like the Norwegian ice skates with their in tubes mounted runner blades. Some manufacturers proudly called them 'Friesland Norwegians'. They were designed by a mr. A. Stheemann. It is likely that he was inspired by the design of American speed skates that became known in Europe thanks to the popular international speed skating championships at the end of the 19th century. They were designed based on the model shown in figure 2. He designed a functional product without any unnecessary detail. The curls were skipped (detail 3a) and the runner blades extended far behind the heel , the very thin blades supported by a 'wooden tail'( detail 3b). These skates have modelled platforms for optimal contact between shoes and skates. 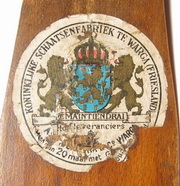 Skates of this type have been produced and sold in the Netherlands until around 1965. These skates have wooden platforms and runner blades fitted in tubular metal frames like the Norwegian speed skates. They therefore were called 'Combi Norwegians'. This model may be considered to have been the last attempt of the traditional Dutch skates making industry to cope with the competition of the Norwegian model. It did not work out, however. Though many serious skaters think this model represents the best wooden skates ever made, they lost the battle against the growing competition of the metal speed skates from the emerging countries. Around 1965 almost all manufacturers of traditional ice skates closed their doors.